Let Chef Julia and Chef Around Town Personal Chef Service take charge of your kitchen. We offer three convenient services to help make your mealtime easier, healthier and more delicious: In-home personalized meal service, in-home cooking classes and small dinner parties. This convenient and affordable personal chef service serves Boston and the surrounding areas. Spending time at home has never been more appealing, and Chef Around Town Personal Chef Service makes it easy for you! Whichever service you choose, we will customize your in-home meals to fit your budget and culinary preferences, tailor your cooking class to meet your current level or challenge you with new techniques and recipes, or plan your next dinner party so you can relax and enjoy your evening at home. We bring all the necessary cooking equipment, outsource only the freshest, highest quality ingredients, and leave your kitchen sparkling clean. 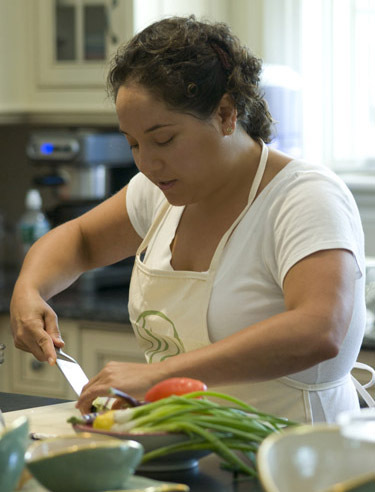 Chef Julia holds a Master's Degree in Gastronomy from Boston University. She has worked as a professional chef for several fine catering companies, as well as for Whole Foods Market. Please contact Chef Julia today for more information.